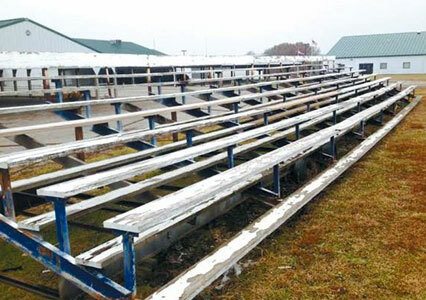 The Livingston County 4-H & FFA Fair Association upgrades bleachers at fairgrounds. CAPTION: Roughly 1,500 people attended the annual truck and tractor pull July 10, 2015, including volunteers and sponsor guests. According to the co-chairman of the event, Aaron Peel, there were a little over 100 entries in Friday nights event. The Livingston County 4-H and FFA fair "started its engine" Friday night with the annual truck and tractor pull. Co-chairman of the event, Aaron Peel, said there were approximately 1,500 people in attendance of the event, topping last year's 1,400. Of that 1,500 in attendance, 1,230 people were paying customers, 100 were volunteers, and 200 were sponsors. Peel also said there were over 100 entries in the pull. There were 17 classes total, each class averaging about eight entries. The truck and tractor pull guests were the first to break in the new bleachers at the fairgrounds. Finishing touches to the bleachers were being made the morning of the pull. Peel said the bleachers were comfortably full for the event. He also said he heard a lot of compliments on the new bleachers, and he thinks the audience was able to better enjoy the event because of them. "The crowd was able to see over the fence instead of looking though it... I think people also felt all-around safer on the new bleachers as well," Peel said. Fair board president, David Beck said he thought the event went very well and he said thanks to the new bleachers there "wasn't a bad seat in the house." The event started at 6:30 p.m. and lasted until it was rained out at 12:45 a.m. Peel said at the time of the rain, there were only two classes left to finish so they decided to cancel the rest of the event. The arena was too muddy to work on after the event, but volunteers stayed behind to pick up trash. Peel said he shut the arena lights off at 2:30 a.m. Saturday morning. Peel had the bulldozer back to work at the arena in preparation for the horse show which was held Sunday night. The annual truck and tractor pull kicked off the county fair on July 10, 2015. Finishing work on the bleachers and work on the arena ground was done in preparation for the event. Local landscaper and fair board member, Aaron Peel, said once the bulldozer arrives at the arena, it would only take his crew about three to four hours to finish the dirt work for the pull. Men working on the bleachers were finishing up putting on transition and skid pieces. CAPTION: New aluminum bleachers for the Livingston County fairgrounds continued as the concrete pads for the bleachers were poured Saturday, and work on the bleachers began Monday. All work has been done by volunteers. Work began on the new bleachers from Hansen Sports on Monday afternoon at the Livingston County 4-H and FFA fairgrounds. These new aluminum bleachers are located along the south side of the fairground arena and replaced the old wooden bleachers that were located at the fairgrounds for years. Beth Weidner, treasurer of the Livingston County Fair Board, said in a C-T article in December that this bleacher upgrade has been a seven-year goal of the fair board. The new bleachers came in two 12-row sections; one section for each side of the announcer stand. The new bleachers seat between 1,200 and 1,400 people. The west unit will provide wheel chair platforms and a ramp for full access. Total estimated funds needed for the project was $220,000. Money for the bleacher project was raised through fundraising, donations, and grants. According to fair board president, David Beck, several volunteers contributed labor in several different phases of the project. Materials such as rock and concrete were also donated or purchased at a reduced price, according to Beck. "The list of people to thank is as long as my arm. The project was really a group effort," Beck said. Concrete pads were poured Saturday, and volunteers have been constructing the bleachers since Monday. The bleachers are erected and all the framing work is complete. Now, volunteers are doing detail work, such as working on kick boards and fencing around the tops and sides of the bleachers. Seats have yet to be installed. 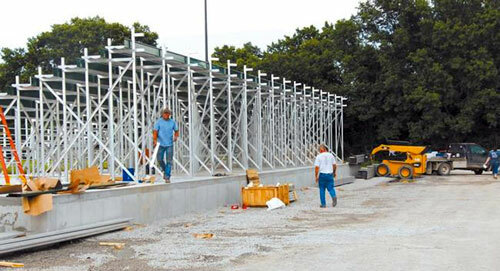 Beck hopes to have the bleachers completed by Saturday; however, they will definitely be completed by the time the annual 4-H and FFA Livingston County Truck and Tractor Pull rolls around. Beck said the bleachers "look pretty sharp so far," and he's excited to see the finished product. CAPTION: These are the bleachers that were recently removed from the Chillicothe fairgrounds and given to Southwest School. The Livingston County Fair Board recently voted, approved and ordered brand new aluminum seating for the grounds. The Livingston County 4-H & FFA Fair Association are making a bleacher upgrade at the fairgrounds. The upgrade of the bleachers located along the south side of the fairground arena has been a seven-year goal since moving to the current fairgrounds, according to Beth Weidner, treasurer of the Livingston County Fair Board. The old wooden bleachers will be upgraded to fully aluminum permanent bleachers, as they will be set on full concrete pads and feature Litton Green riser boards, Weidner said. The Livingston County 4-H & FFA Fair Association Board voted to accept the bid from Hanson Sports for this project during their November meeting. Hanson Sports is currently preparing two custom 12-row sections, one for each side of the announcer stand. These new bleachers will seat between 1,200 and 1,400 spectators total. The west unit will provide wheel chair platforms and a ramp for full access. 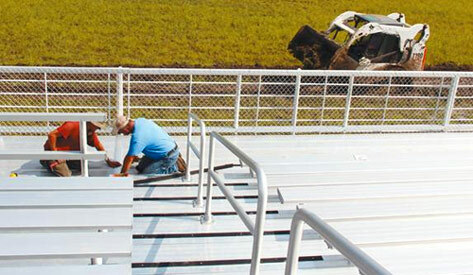 The bleacher units are fully warranted and the company has excellent recommendations on customer service, quality and durability, Weidner reported. Pad preparation and pouring will begin as weather permits with construction to follow. Volunteer labor will be used in several phases of the work. The fair board would like this project to be complete by the 2015 Livingston County Fair Truck and Tractor Pull scheduled for July 10. 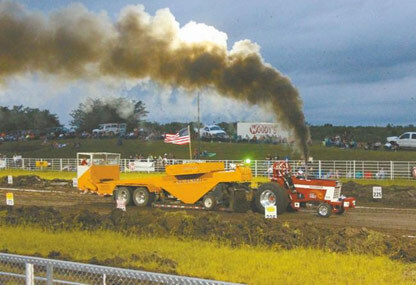 Funds for the project have been raised through the annual Truck and Tractor Pull and its many sponsors and supporters. The Truck and Tractor Pull kicks off the Livingston County 4-H & FFA Fair every year since moving to the new fairgrounds in 2007. The Annual Improvement Fund Drive among Fair Association members has also contributed to the project along with several grants secured through Chula Co-op. Further funding is being sought through a Bench Sponsorship Campaign and additional grant sources. Total estimated funds needed to complete the project is $220,000. Anyone interested in supporting the project by sponsoring a bench or through a donation of materials or time should contact David Beck, Fair Board President at 660-247-3485. Beck said these benches are more modern and more safe, and they will also provide a better view of events because the new bleachers set higher. The Fairground Arena is the site of several events in addition to the annual truck and tractor pull. The horse show, music show and Super Teen Contest are all scheduled in the arena during the fair week. Spectators of each of these events and more will benefit from these new bleachers. The Board is confident that this bleacher upgrade will promote the use of the arena for many other events and activities throughout the year. "We're pretty pleased to be getting it off the wish list and into the reality phase," Weidner said. "We've been wanting to get rid of those old rickety bleachers for a long time, Beck added.